Paris Est (or Gare de l’East, East Station), is one of the largest and oldest railway stations in Paris. Originally called the Strasbourg Platform, it opened in 1849 as the western terminus for the Paris-Strasbourg railway. In 1854 the service was expanded to Mulhouse and the station renamed Gare de l’Est. In 1883 it began services on the Orient Express to Istanbul. Gare de l'Est was used for large-scale transport of French troops in World War I. Today it is the major terminus for services to eastern France, and major cities in Europe including Zurich in Switzerland, Munich in Germany and Vienna in Austria. Take RER(Regional Express Railway) train Line B directly to the airport. Gare du Nord (or Paris Nord), built between 1861 and 1864, is the busiest railway station in Europe. It’s the main station for trains to North France and also for the Eurostar from London, Lille and Brussels. It runs both TGV trains and SNCF trains. Eurostar arrives here from London, Brussels, and Lille. Paris Gare de Lyon is one of the busiest stations in France and Europe. Built for the World Exposition of 1900, it’s a splendid building both inside and out where it’s dominated by a huge clock tower. Even if you’re not using the station, I thoroughly recommend a meal at the fabulous restaurant, Le Train Bleu. A Belle Epoque gem, it’s decorated more like a cathedral than a restaurant with wonderful gold decorations and paintings on the walls and ceilings. Le Train Bleu and the station have appeared in films like Nikita by Luc Besson, The Mystery of the Blue Train by Agatha Christie, Mr Bean’s Holiday with Rowan Atkinson and the 2010 film The Tourist. Paris Gare de Lyon city links include Lyon, Marseille, Paris and Geneva, Milan in Italy. Opened in 1840 as Gare de l’Ouest, Gare Montparnasse became famous for the derailment of the Granville-Paris Express which overran the buffer, continued across 30 metres (100 ft) of the station concourse, went through the end wall and smashed out of the station to land on its nose in the Place de Rennes, 10 metres (33 ft) below the platform level. The photograph is well known, as is the incident which was used in the film Silver Streak and in Hugo, the children’s film. The station was totally rebuilt in 1969 with an extension built in 1990 for the TGV Atlantique to the west and south-west of France. Gare Montparnasse serves west and south-west France, southern Normandy, Brittany, Pays de la Loire, Tours, Poitou-Charentes, Aquitaine, Midi-Pyrenees, and north-west Spain. Tours, Bordeaux, Rennes and Nantes. Popular TER services include trains to Dreux and Granville and Versailles-Chantier towards Le Mans. Air France coach line 4, every 30 minutes. Paris Gare d'Austerlitz was built in 1840 for the Paris-Corbeil and then the Paris-Orleans line. Originally called Gare d’Orleans, the station was renamed after the Czech town where Napoleon I defeated his enemies. The station was extended in 1865-1868. When the TGV Atlantique route was built, the terminus moved to Gare Montparnasse and Austerlitz lost most of its original long-distance services to the southwest. Today Austerlitz serves south-central France and night trains to the south of France and Spain. The Elipsos Train Hotels (Trenhotel) operated jointly between RENFE and SNCF operate from here to Madrid & Barcelona. They generally leave around 7.30pm local time and travel overnight arriving the next morning at their destinations. Paris Saint-Lazare was originally built 150 meters north-west of where it is currently and opened in 1837. It rapidly expanded and by 1900 was the terminus for nine lines. 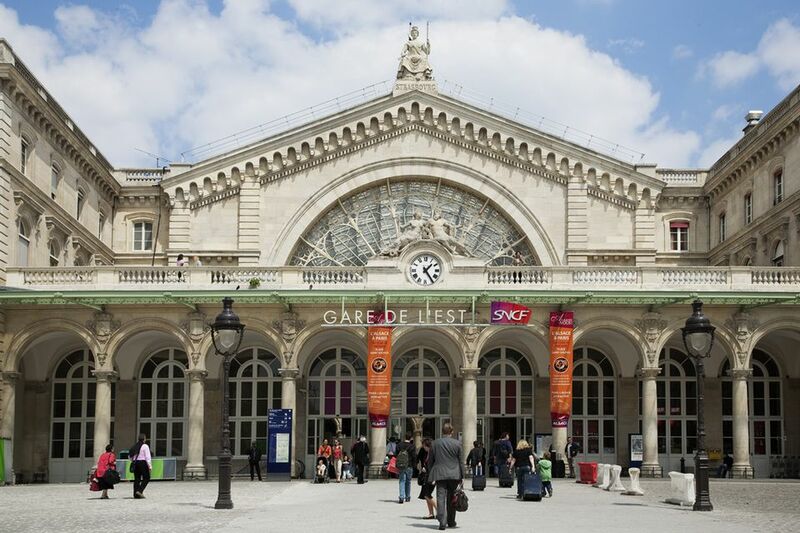 The second busiest train station in Europe and just behind the Gare du Nord, it serves destinations and cities in northern France.